I never truly know what to expect with Andrew Smith's books - the few I've read have been a little bit out there, but generally speaking, I've enjoyed them. For the most part, this book was the same. 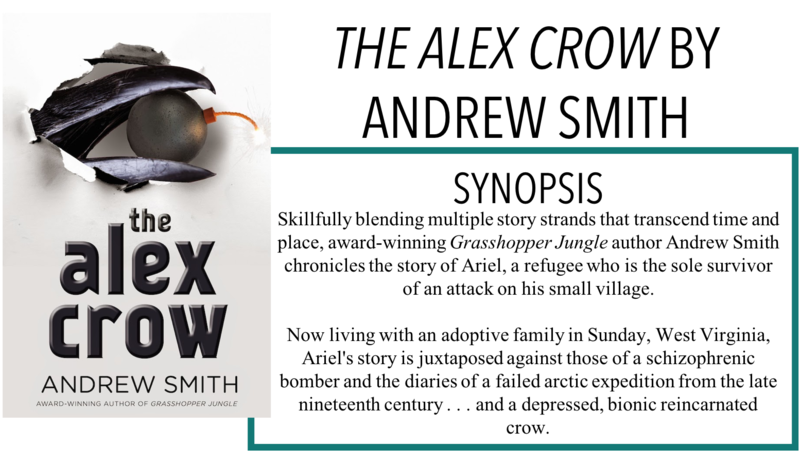 I am back with another review, The Alex Crow by Andrew Smith. The main story follows Ariel, an orphaned refugee living with his adoptive parents and brother in America. Most of the book follows Ariel and his brother Max, both of whom have been sent to a camp for boys that are addicted to video games and technology. Except, neither boy is addicted to video games - their father just happens to work for the same company and sends the boys there, presumably to get them out of his hair, for free. Intertwined in this main storyline is how Ariel ended up a refugee, as well as the strange ramblings of a science experiment gone wrong, and the diary of a long-dead explorer. To be completely honest with you, I only really read the parts that dealt with Ariel - I skimmed and then skipped over entirely the parts about the "melting man" and the explorer. They may have added to the story in some way but for the most part, I understood what was going on without their parts. I think it this had just focused on Ariel and his journey, as well as the present timeline, I would give this book a higher rating. In fact, when I first started, I found myself drawn away from the story when these parts came up and I almost DNF'd the book whenever I got to one. That, ultimately, is the reason why I didn't read those parts. This book really reminded me of what I imagined Smith's other books, Winger and it's sequel Stand-Off probably would have been like, had I read them. There was a lot of male bonding and camaraderie in this book, which I feel like I haven't seen recently, despite this book being published a few years ago. I thought it juxtaposed well with the terrifying and brutal depictions of Ariel's past and made me enjoy the book more. Overall, if you are a fan of Smith's novels and know what you're getting yourself into, I think you'll really enjoy this one!